Housefull malayalam movie review and FDFS reports from theatres in Kerala are given here. It is a family entertainer with lot of comedy scenes in it. If you are planning to have a weekend with lot of fun and enjoyment, the go watch this comedy movie. Read the below article to know more about the movie, its story line, cast and crew. There are lot of movies released on this particular day, the 15th of February in Kerala. "Housefull", directed by debutant director Linson Antony is one among them. This movie is a family entertainer which has the element of 'love' and 'comedy' in it. It is a movie worth watching along with our family members as the story is all about a family. The Malayalam movie, "Housefull" talks about a police constable 'Ananthan', who remains to be a bachelor until the age of 36 years. It is not because that he does not want a married life, but due to minor reasons none of the marriage proposals he gets works out. Anathan meets 'Emily', who is working in a textile shop. Finally Anathan marries 'Emily' due to certain situations but both the family members were against this marriage. Anathan and Emily lead a happy married life hoping that once they have a child, their parents will accept them. Unfortunately, luck did not favor them, hence they did not have a child for long time. At last when God blessed them, Emily gave birth to not one but four children at a time. Thus their house was filled with children, that is how the movie is named as "Housefull". The story progresses with the sequence of things happening in their life there after. 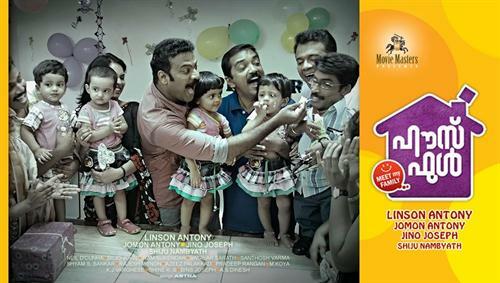 The Malayalam movie "Housefull" is directed by Linson Antony under the banner of Cinema Paradiso Release. Tini Tom is featured in the male lead role while Jyothirmayi comes in the female lead role. Tini Tom appears as Constable Ananthan and Jyothirmayi as Emily. The script of this movie is penned by Shibu Nambiath. The other important cast includes Vijayaraghavan, Shammi Thilakan, Guinness Pakru, Bhagath Manuel, Jayaraj Warrior etc. The popular song of this movie is sung by Renjith. This is the first time the mimicry artist Tini Tom appears in a movie as a central character. He has appeared in various stage shows, TV comedy programs and in some Malayalam movies such as Mimics Action 500, Panchapandavar, Pattalam, Vajram, Athisayan, Annan Thampi, Indian Rupee, Ringtone, Pranchiyettan & the Saint, Beautiful, Thalsamayam Oru Penkutty, Shikari, Spirit, Naughty Professor, Namukku Parkan, The Hitlist etc. He is a judge for the show "Sundari Neeyum Sundaran Njanum". Even though he is familiar to us, we have never got an opportunity to see him playing a lead role. Now that has come to an end through this movie. The movie "Housefull" is a family entertainer with lot of comedy scenes in it. If you are giving priority for family oriented movie with humor, then this movie is a good choice. Mimicry artist Tini Tom has appeared in the lead role and he has done his part well. It is a nice attempt made by a new director. As there are lot of movies released today, this movie won't be the best among them but surely this will get the third place. It is a movie worth watching and it will be a good entertainer for the money you spend.